Teacher and leaners of Green Leaves Primary school, ecstatic about their new educational material. 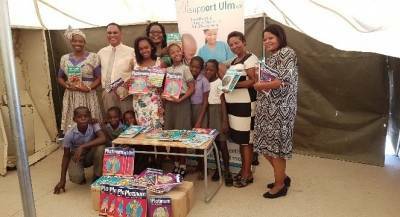 As part of a huge drive in supporting educating, the Ohorongo Otavi Community Trust (OOCT), in collaboration with Support Ulm e.V. donated textbooks and teachers’ guides to the Green Leave Primary School in Okahandja Park, an informal settlement on the outskirts of Windhoek. This donation forms only a small part of over 1 600 textbooks and teachers’ guides which are being distributed to schools in Otjozondjupa, Ohangwena, Oshana and Khomas regions and consist of textbooks in the subjects of English, Natural Science Social Studies and Afrikaans for Grades 4 up to 7. “This donation is our response to numerous calls from the Minister of Education to the private sector, to support education in areas of urgent need,” said Hans-Wilhelm Schütte, Managing Director of Ohorongo Cement. During the launch of the Friends of Education in Namibia Special Initiative (FENSI) in 2017, the Minister of Education, Honourable Katrina Hanse-Himarwa, called on willing friends of education to support her ministry in order to help solve the challenges facing the public education sector. GreenGreen Leaves Primary School is among the schools on the outskirts of the capital that is struggling to secure enough textbooks and other study material. According to Chanville Mckrill, Principal of the school, their current textbook ration stands at three learners per textbook. He says it is a great challenge especially for the weaker learners as they have access to a textbook for only two days a week. Mckrill adds that despite these challenges they are coping as they remain positive and give it their all to ensure that the learners get the best education. “This is not the end. To help mitigate some of the educational resource challenges that the public education system is facing, this year, we will procure more textbooks for upper primary leaners. This is our continued commitment to the future leaders of Namibia,” Schütte pledged. On an annual basis, OOCT and Support Ulm e.V. donate tons of cement towards the construction of additional classrooms and renovations of schools countrywide. Support Ulm e.V. is a German non-profit organization, which over the years, has organized various fundraising activities to raise funds that are invested in various projects benefiting the Namibian population.